The expected vote on Monday by the McAllen City Commission over whether to live up to its commitment and help fund the UTRGV medical school is all about perception. But we should never discount the power of perception in the political arena. And for that reason, we strongly urge the city commission to vote in favor of fulfilling its agreement and granting the money — and we urge the commission to vote unanimously in favor of this. McAllen City Commissioners are expected to vote during their last meeting of the current fiscal year on whether to give $1 million to the University of Texas Rio Grande Valley School of Medicine. This figure represents $1 million less than what city officials had originally committed to when the Rio Grande Valley fought so hard to convince the Texas Legislature to grant permission to build a medical school here and fulfill a dream that was decades in the making. Let’s be clear: Elected leaders, businessman and other policymakers in the region are clever enough to find the money necessary to fund the medical school, albeit at a level that may slow its potential in the early stages of its development. What’s at stake here is the perception given to others in the state — particularly members of the Texas Legislature who have the power to help or hinder the medical school’s development in future years through their control of the purse strings. As recently as July, when Gov. Greg Abbott visited McAllen on the second day of the launch of his re-election campaign, did the governor underscore to The Monitor the importance of the community demonstrating its support of the UTRGV medical school. Two failed attempts in Hidalgo County to create a healthcare district that would have helped with medical school funding — and would have relieved local cities like McAllen of their commitment — are now being held against us by lawmakers from other parts of the state as proof of diluted support. So it would not be hyperbole to say that policymakers throughout Texas are looking on with interest at what the McAllen City Commission does Monday. But there’s another perception being created or fed into with this vote: The perception of McAllen as a regional leader among cities. Monday’s vote comes at a time when the cities of Pharr and Edinburg, in particular, are enjoying strong economic headwinds often at the expense of McAllen, especially on the retail front. 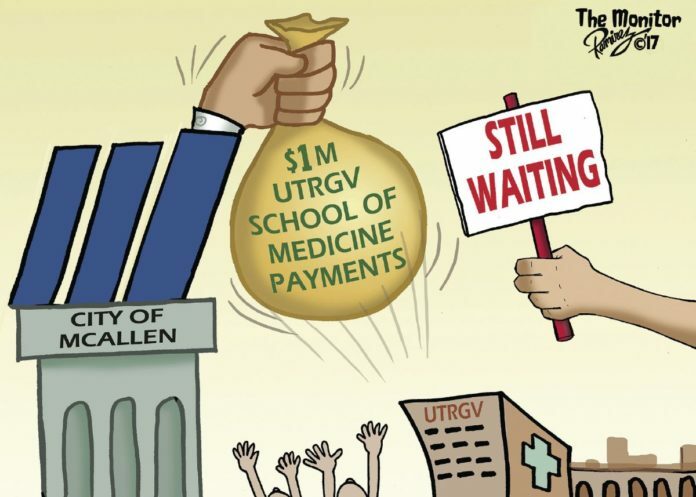 To renege once again on its commitment to the medical school, McAllen City Commissioners would be diminishing its traditional leadership role in the upper Valley at a time when it can ill afford to do so. Honor your commitment, McAllen City Commission, and demonstrate regional leadership.